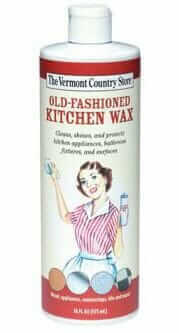 If wood kitchen cabinets like Nancy's were built using "unitized" construction, they likely cannot be removed and re-arranged. Kelly explains it also — and has a photo — but in short, ‘unitized’ means that everything is built as one complete to-size unit. There is a big long front — with all the pieces kind of attached behind it. If you start to dis-assemble one of these units, Kelly says, they may fall apart — kind of like a house of cards, I’d think. Kelly also says that banks of drawers were less common in this style of construction, because of the labor involved, I presume. I am guessing that local “merchant” builders used this type of cabinet because (1) they could have the cabinets made locally and take a mark-up on the sale (rather than giving the sale to a national cabinet-making company that sold and shipped modular boxes), (2) because this was a less expensive solution, and homeowners probably had no idea of the difference, and (3) because it was very easy, with this solution, to have odd-sized lengths or configurations made (although I am sure merchant builders avoided odd-sizes). Kelly points out that this style of construction was sold by “by the linear foot” — terminology that some people still refer to but which is, for all intents and purposes, apocryphal and irrelevant when buying kitchen cabinets today, which have too many gizmos and doodads involved. Interestingly (to me, because I worked in the auto industry for 17 years), almost all cars are made using “unitized” construction today. It reduces weight. The old skool way is “framed” construction — still used on many if not most trucks, I believe. Frames add weight, and hurt fuel economy — hence, virtually the entire car industry has moved to unitized construction. All this said, there were national kitchen cabinet companies making and selling modular units. The advertisement above is for Curtis Cabinets, from 1938. 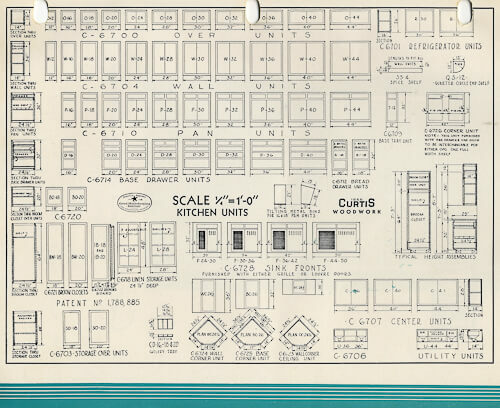 They sold many shapes and styles of modular kitchen units. Crikey, they must have been shipped using the Wells Fargo Wagon! Thanks, Kelly, for the explanation! I have the cabinets pictured above exactly. What type of wood are they do you think? I’m guessing mine are maple (1962) and in great condition. I’m a vintage sort of girl. Thx for cleaning, polishing info in posts. Trying to match new ceiling fans to the wood. Hi Jennifer, I am not good at identifying wood species… And on cleaning and polishing, I am also not an expert; sometimes readers will offer suggestions or share their experience — but you should do your own research. 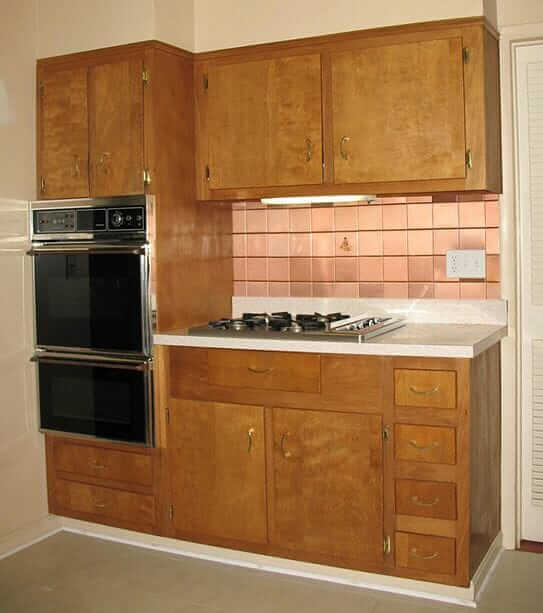 I am looking for this kind of kitchen cabinets for my mid century kitchen! they were made of birch I think. and just varnished – not stained. Had a rounded corner not straight edge. Any ideas where I can find them. Some even had a shelf that pulled out and up that had the mixer bolted to it! !